Alliance Source Testing attended the Air and Waste Management Association’s Conference on June 5-8, 2017 and shared the benefits of the Alliance Advantage. The conference was located in Pittsburgh, Pennsylvania. This year’s conference offered many educational sessions, events, exhibits. Additionally, the conference provided opportunities to learn, share, connect, and grow. Alliance Source Testing educated attendees on the Alliance Advantage and why it is so important in the stack testing process. Let us know if we can help you meet your stack testing needs with our proven system. Feel free to contact us for a quote. 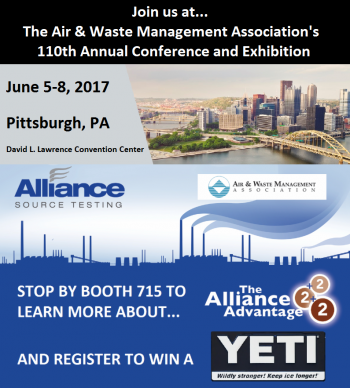 Founded in 1907, the Air & Waste Management Association (A&WMA) is a nonprofit, nonpartisan professional organization enhancing knowledge and expertise by providing a neutral forum for information exchange, professional development, networking opportunities, public education, and outreach to more than 5,000 environmental professionals in 65 countries. A&WMA promotes global environmental responsibility and increases the effectiveness of organizations to make critical decisions that benefit society. Learn more about A&WMA. The 2017 Annual Conference theme is “Bridging Environment, Energy and Health.” Learn more about next year’s conference at https://www.awma.org/ace2017.